It seems as though the major retailers in the baby industry are the biggest culprits when it comes to using chemicals and toxic materials in their products. 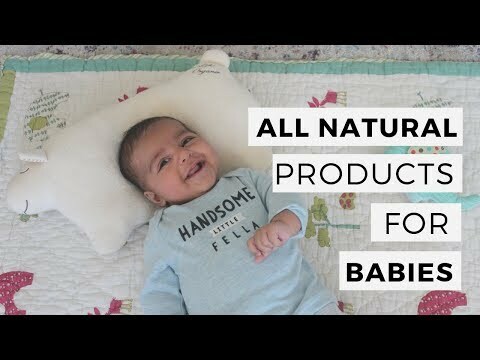 After extensive research and trial and error, here are some of the all-natural baby products I swear by. We have three Colgate Eco Classica III Organic Crib Mattress for our twins and newborn and love it. Made of 100% cotton and natural fibers, the mattress is firm yet comfortable. It fits right into our 3-in-1 crib/toddler bed which makes life so much simpler with each phase of our babies’ lives. Whether it’s for you or the baby, coconut oil is the best emollient, moisturizer, daily diaper rash barrier cream, hair oil, you name it! We use Tropical Life Extra Virgin Coconut Oil. Why use lotions with ingredients you can’t pronounce when this works just as well, if not better! My little ones often had mosquito bites crop up on their hands and feet (I guess they can’t resist that baby fat! ), so I use California Baby Bug Repellent whenever we go outside in the summer. You can spray it on their skin and on the stroller to add an ‘aura’ of added protection. The design of these Sunzel Baby Toothbrushes prevent your toddler from shoving their toothbrush to the back of their mouth. These initial toothbrushes are a great way for growing toddlers to get in a routine of brushing their teeth and maintaining their oral health. According to WebMD, “in children under 6 years of age, fluoride becomes incorporated into the development of permanent teeth, making it difficult for acids to demineralize the teeth. Fluoride also helps speed remineralization as well as disrupts acid production in already erupted teeth of both children and adults.” Our babies use Tom’s Toddler Floride-Free Toothpaste. Oh the painful diaper rash! Since urine and stool (especially the watery poopy blowouts. TMI, I know!) are acidic, they can easily cause rashes on your baby’s tush and they worsen because they’re in diapers all day long. The most important thing to do when your little one has a burn on their bum is to keep the area as dry as possible and use a barrier cream + vaseline. We use Burt’s Bees Diaper Rash Cream as a barrier cream and good ol’ petroleum jelly to seal the wound shut. I honestly love all of Honest’s products. ;) The Honest Hand Sanitizer smells amazing and kills 99.9% of germs with a few spritzes. Kids have uber sensitive skin so just like us, they should wear sunscreen every day. My entire family uses Alba Botanica Sunscreen SPF 30 which is made for sensitive skin. What all natural products does your little one use? Leave me a message in the comments below!